Fans of WWII German armor will be happy to know that on August 25, Osprety Publishing has slated for release a new book on the Sturmartillerie. Titled Sturmartillerie: Spearhead of the infantry , this new volume is hardcover with 288 pages and authored by Thomas Anderson. Anderson is a specialist in the German armored fighting vehicles of World War II, having written books on the Tiger and the Ferdinand and Elefant Tank Destroyer for Osprey. This new book appears similar in size and format to his previous Osprey hardcovers, at least based on the cover (yes, we know we shouldn’t judge a book by it’s cover!) Mr Anderson also written for Osprey a history of the Panzerwaffe in two volumes. The first volume is available now, the second volume will be available next year. The Sturmartillerie was a key part of Germany’s armoured arsenal throughout World War II. Its armoured assault guns were designed to support the artillery on the battlefield, largely using the purpose-built Sturmgeschütz infantry support gun. Earlier in the year we posted that the book “The History of the Panzerwaffe Volume 1: 1939-1942” by Thomas Anderson would be released on October 20 of this year. That date has been pushed back to December 17, 2015 according to the Osprey Publishing website. Thomas Anderson has written several hardcover books for Osprey on German WW2 Armor. This new book promises to be a substantial work, coming in at 304 pages. And just in time for Christmas for all those Panzer fans out there. The Germans transformed armoured warfare from a lumbering and ponderous experiment in World War I into something that could decide the outcome of conflicts. This technical and operational history is the definitive guide to the legendary Panzerwaffe, from its very infancy to the days when it made Europe its garden path at the height of Nazi German power. With rare and revealing combat reports, along with photographs sourced from previously unseen private and archival collections, it uncovers the technical and operational stories of the formidable armoured beasts that formed the backbone of the German war machine – tanks such as the Panzer I, II and 38(t). 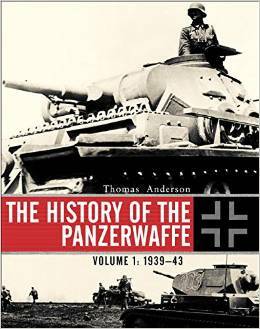 Amazon is listing a October 20, 2015 release date for the upcoming book “The History of the Panzerwaffe Volume 1: 1939-1943 by Thomas Anderson. Published by Osprey, the book is listed as having 304 pages and is in hardcover. In regards to books on armor, Osprey is primarily known for their “New Vanguard” series of slender soft cover books. Over the past few years Osprey has published several hardcover books on armor as well, all of them focusing on German WW2 panzers. This is the definitive history of the evolution of the feared German Panzerwaffe, from its earliest beginings to the height of its success. With rare and revealing combat reports and photographs sourced from previously unseen private and archival collections, it uncovers the technical and operational stories of the formidable armored beasts that formed the backbone of the German war machine–tanks such as the Panzer I, II and 38(t). The Germans transformed armored warfare from a lumbering and ponderous experiment in World War I, into something that could decide the outcome of conflicts. This technical and operational history is the definitive guide to the legendary Panzerwaffe, from its very infancy to the days when it made Europe its garden path at the height of Nazi German power. Osprey Publishing is releasing a new hardcover book on the German WWII Ferdinand and Elefant tank destroyer on April 21, 2015. This book is by Thomas Anderson. In 2013 Osprey published a book by the same author on the German Tiger tank. 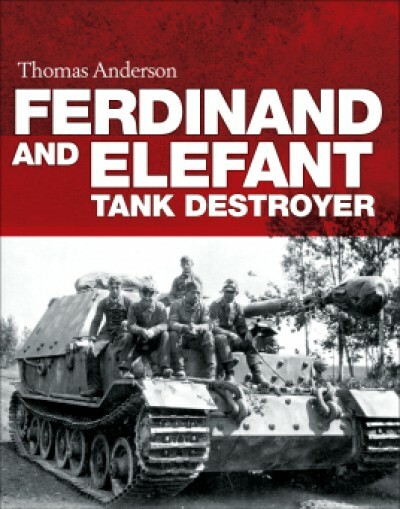 Guessing from the dust jacket, this new book on the Ferdinand will be similar in style to the Tiger book. While Osprey Publishing’s recent hardcover book on tanks have been limited to WWII German vehicles (Panther, Tiger, Ferdinand), their New Vanguard series of softcover books cover a wide variety of tanks and armored vehicles.